So how does all this relate to coaching and where would we place coaching on the spectrum. 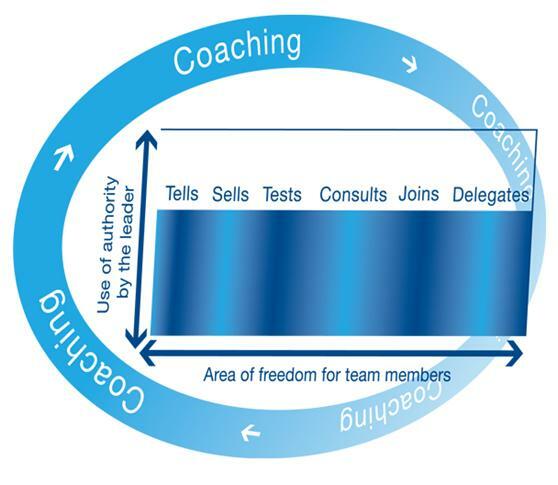 Some argue that coaching is all about empowering others and so must sit ‘right of centre’ towards delegation. However, we can also see that perhaps coaching doesn’t belong to this range of alternatives at all as it almost represents a philosophy of communication rather than a style. In many ways coaching is a means of adopting the advantages of each of the other styles whilst minimizing the disadvantages. Good coaches don’t fear loss of control as they know that the people they coach will have formulated their plans and ideas in their presence. Thus the coach has the ability to warn against a certain course of action if it is against the rules or likely to cause problems. Also, we’ve seen that coaching is an effective way for managers to build trust in their teams and so they can resort to Tell when the situation demands it without worrying about the team being uncooperative or becoming disillusioned. So far we have considered the merits of various communication styles in a general context. What about when we need to communicate with another to help them develop? It seems that Tell is dominant here and perhaps this is because most of us were conditioned to learn in this way at school. We would sit in rows of desks while the teacher would tell us what we needed to do and how to do it and lessons would consist of being told what we needed to know. But this doesn’t always work. Try explaining to someone how to do up a tie or lace a training shoe without showing them – it’s almost impossible. To do so requires us firstly to understand exactly the process that needs to be done and then to find the language to convey that process to another person in a way they can understand. The modern world of work is changing so fast that we can no longer be certain that the ways and methods we used to become successful will be valid for the next generation. Solving today’s problems with yesterday’s solutions is a big risk. Coaching presents a way of dealing with these problems as it is concerned with drawing our rather than putting in and thus enables people to learn in their own way and at their own speed. In this way we get learning and development that sticks in the same way as learning to swim or to ride a bicycle. Coaching is the best way to involve people in their own learning. Great reference to the Chinese proverb! Although I’m not a teacher, I know that I comprehend best by doing and so I try to remember that when I’m teaching something to someone else. Hi Stephanie. Thanks for taking the time to comment. A wise man once told me that learing is easier than being taught and I find proof of this theory day in and day out. Good luck and keep in touch.